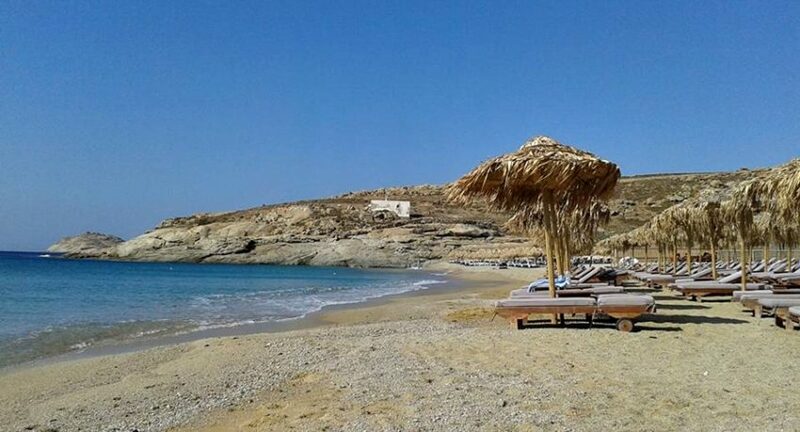 Lia beach is one of the last southern beaches in Mykonos island and is well known for its exotic beauty. It took its name from the chapel of Prophet Elias that was there. The distance from the town is big enough, you can go only with your own vehicle, but the beauty of the beach will reward you. It is rocky, with coarse sand and fine pebbles, emerald crystal and deep water. The pieces of the beach in front of the restaurants are organized, with sun beds and umbrellas and provides very good beach service. In these restaurants you can enjoy the Aegean cuisine with vegetables and wine from their own production, as well as fresh seafood. In the middle of the beach there is empty space to put your own umbrella without having to pay. Lia beach is a great place to enjoy sunbathing and swimming. It has been described as one of the most peaceful and relaxing places on the island. Over the last years in Lia Beach has opened a diving school, because the water there is deep enough, the seabed is rocky with white sand, it’s the ideal place for diving. The staff of the diving school consists from well trained and professionals, who will offer you unforgettable experiences from the reef of Lia, from the wreck located off the beach, and from the underwater caves in Tragonisi and Octopus rocky islands. They also organize tours with inflatable boat. It is a pretty quiet beach and that’s why older people and families love it. It is also featured as a gay friendly like most beaches in Mykonos. If you want to be isolated from the crowds, right next is Tigani, a desert beach and you can go there by walking on the rocks. Distance from the town: 14 km.